This is the most popular tent we rent. This tent can accommodate 4 tables and 40 chairs comfortably. A grass area of 26' x 26' is required for installation. All tops are green and white striped. The tops are made of 12-ounce flame retardant vinyl, laminated polyester. These tops block out all sun and rain. 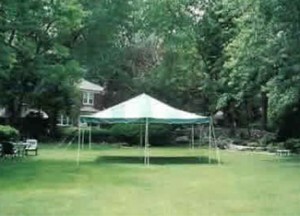 This tent is a great option for a larger party. This tent can accommodate 6 tables and 60 chairs comfortably. A grass area of 26' x 36' is required for installation. All tops are green and white striped. The tops are made of 12-ounce flame retardant vinyl, laminated polyester. These tops block out all sun and rain. This is our largest tent. 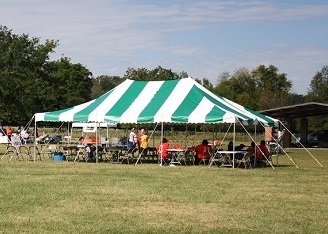 This tent can accommodate 8 tables and 80 chairs comfortably. A grass area of 26' x 46' is required for installation. All tops are red and white striped. The tops are made of 12-ounce flame retardant vinyl, laminated polyester. These tops block out all sun and rain. If you don't have a grass area and still want a large tent this type of tent is for you. We can accommodate as little as 40 people up to 270 people. The frame tents are all white and come in the following sizes: 20×20, 20×30, 20×40, 30×30, 30×50, 30×60 and 30×90. These tents can be installed anywhere as long as you have the dimensions of the tent available. Great for decks, driveways, or parking lots. The tops are made of 12-ounce flame retardant vinyl, laminated polyester. These tops block out all sun and rain. 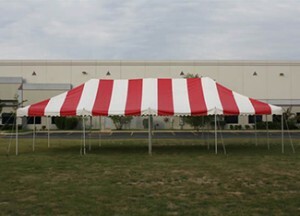 We have framed EZ-UP Tents available in 10' x 10' and 10' x 20'. These tents can be installed on any surface as long as you have the dimensions of tent available. Our 10' x 20' can accommodate up to 20 people. Our 10' x 10' tents are not rented individually and are add-ons to larger tent rentals. These tops are made of a 500D Poly that blocks out all sun and rain. 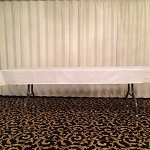 We carry 8′ rectangular banquet tables that are 30″ in width and 5′ round tables. 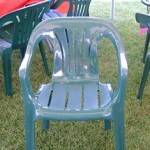 The chairs we carry are resin high back arm chairs and are only available in the color green or sand. We also carry sides & linen tablecloths (Highly recommended) as great add-ons to your tent rental experience. 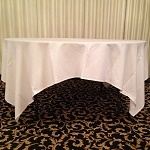 The sizes of the linen tablecloths are 52”x114” for banquet tables and 88”x88” for round tables. We are a business founded and run by the same family since 1994. Experience makes a difference.